At Blue Rock Dog Training, our primary goal is to work with the family and their dog to correct behavior issues and to help produce the best canine family member possible. We not only train dogs, we educate people about their dogs. There is so much misinformation and so many misconceptions about how to handle dogs that it’s no wonder some have a hard time managing them successfully. We break down our technique so that our clients can understand, and reinforce, our approach for the best long-term results. Our trainers use only positive reinforcement techniques, never pain our punishment. Dogs are motivated to learn and actually enjoy the process. Through both our in-home training and group classes, we will identify and meet your dog’s needs through personal attention and individual care. My affinity for training animals runs deep, and began many years ago with my work on Blue Rock Farm training foals, a wild mustang, and many adult horses, as well as providing riding instruction. Caring for the many animals on the farm has led me to my life’s passion. My realization of how important dog training happened with own beloved, challenging dog, Dozen (my twelfth dog). Dozen was a non-stop perpetual motion machine, and I worked hard to socialize him with people and other dogs. But, he had behavior issues that caused him to be reactive to other dogs, to the point that I thought he’d need to live a life separate from other canines. I sought private training for him, and was able to learn the causes of his aggression, and with my trainer, resolve them. 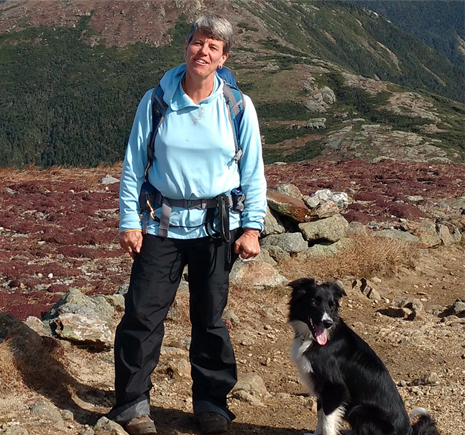 My experience with Dozen changed the course of my life, and sparked a love for training dogs. I understand from personal experience how embarrassing it can be to have a dog that’s difficult or ill-behaved, and how joyful and rewarding it can be to resolve that and help your dog become the best-behaved companion they can be. I love to pass on that feeling to my clients, and want them to have fun with their dogs so they can both live happier lives! Not only did I learn from hands-on experience, but I also sought out the best education in dog training, and have achieved some of the highest honors possible in the field. Completed an internship in the Canine Head Start Program. Instructor at CHS for 3.5 years after completion of training. 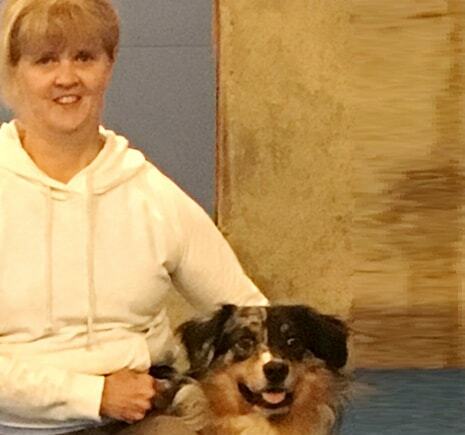 The Karen Pryor Academy is a nationally recognized school for dog trainers, and its’ graduates are certified to have completed an intense educational program in force-free training principles. Only the best are certified, and I’m a proud recipient of a certification from this premier academy. Learn more here. Approved by the American Kennel Club as a Canine Good Citizen Evaluator for the AKC Canine Good Citizen Test. In addition to my canine training background, I am also a Registered Nurse (RN) and professional riding instructor. Growing up on my family farm, I was always searching for a better way to communicate with the animals. I thought there must be a better way for us to understand each other. One of my first horses was a 2-year old Appaloosa. I was just 12 years old when we got him. We had a very deep bond that lasted for over 30 years. He was the one that started my journey to train more thoughtfully. During the years my husband and I were raising our 3 young children, we had many animals, including 2 golden retrievers, Orion and Caliph. Orion and I competed in obedience. He was willing to work with me, but not very excited about it so eventually we stopped competing! My love for animals developed into a career as a veterinary technician. One day a puppy came into the animal hospital with aggression problems. The owner was looking at the option of euthanasia for the puppy. That affected me deeply and it sent me searching for more skills to help owners and their companions. Taking my first course at the Monadnock Humane Society, I clicker-trained a shelter dog that was scheduled to be going home with his new family at the end of a week. I discovered the power of training with a conditioned reinforcer. This set the seed of training thoughtfully. After this first course, I taught puppy kindergarten classes at the veterinary hospital. The course included basic skills: sit, down, come, loose leash walking, going in the exam rooms and getting on the scale, and walking on different surfaces. In my quest to learn more about training, I took a position at Canine Head Start, assisting in the following classes: Puppy kindergarten 1, 2 and Advanced, Recall 1 and 2, Canine Good Citizen, Polite Leash 1 and 2, Agility Foundation and Tricks class. This passion in me has grown so strong and exciting that I can’t seem to get enough. I’m currently working on 2 online courses – Clicker Training for Horses with Alexandra Kurland and Absolute Dogs Training. In addition to being a Veterinary Technician for 36 years, I have also obtained the following certifications. My big Retriever/Hound mix Hank and I have worked with Barb in a class setting and for focused individual training sessions. We both think she’s great. Barb had a fun and gentle way of helping Hank learn how to get lots of “good boys” and good treats for good behavior, and helping me to learn how to understand and work with my 7-year old rescue dog. I’d recommend Barb to anyone looking to learn how to train their dog. Blue Rock is the name of our family farm. I came up with the name years ago when my dad and I were clearing rocks from the vegetable garden. The soil here is so rocky that we had to scoop the dirt up with the tractor bucket and dump it out and then pick the rocks out. We ended up with three rock piles that were as big as Volkswagons! With Blue Rock Dog Training, I hope to offer my clients rock solid service and honor the legacy of the farm.